It may be sport, or it may be exams, or anything else in life, that causes your child to break into tears at losing, or become aggressive because they have won, or have a melt-down. They may decide they suddenly don’t want to do the one thing they really loved. Coping with pressure is something we spend our whole lives learning to do, with varying success. What if someone could advise us how to help our children navigate through this? On the 28th March at 17.45 at Neapolis University in Pafos, Sacha Appleton Tennis Academy is hosting a seminar designed to help you specifically with this. 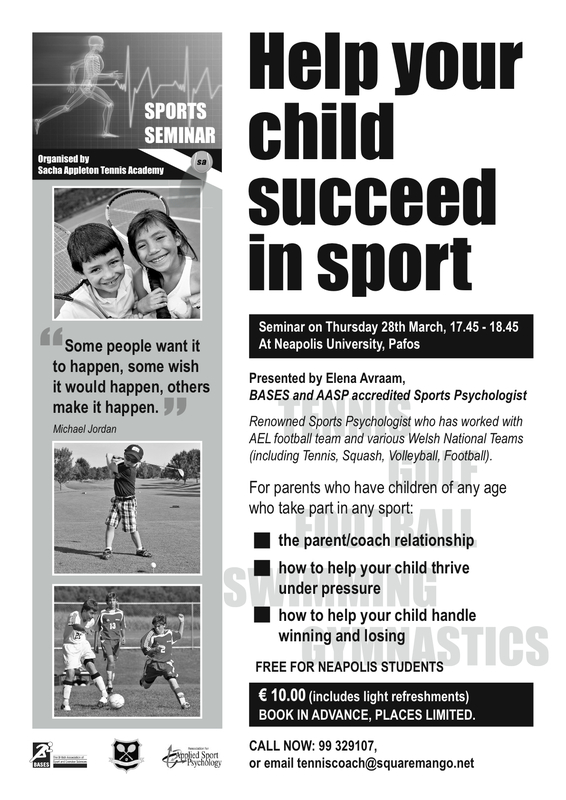 Entitled “How to help your child succeed in sport” and lasting around 1 hour, it will be presented by Elena Avraam, a BASES and AASP accredited Sports Psychologist. She has worked with various Welsh National Teams (including Tennis, Squash, Volleyball, Football) and currently helps AEL football team in Cyprus and several junior tennis players who are competing abroad. The seminar will be in English, with translation into Russian and Greek, if required and will cost € 10, including refreshments. It will be followed by a separate hour and a half presentation for competitors aimed at helping improve tennis performance (or indeed any other sport) by 15% or more. It will tackle performing under pressure, helping you identify your weaknesses and giving you tools to handle it. Children can attend, but must be at least 10 years old and mature enough to understand and benefit from the performance training. The cost or this will be € 15. There will be discounts available for those wishing to attend both seminars, or for families who wish to attend together. Places are limited and must be booked in advance. To find out more, call me on 99 329107, or email tenniscoach@squaremango.net. This entry was posted in Cyprus Tennis Coaching, Events, Winning Mentality and tagged Aphrodite Hills, Baghdatis, Children Tennis Coaching, Cyprus, Cyprus Tennis, Cyprus Tennis Coach, Cyprus Tennis Federation, Learning Tennis, Neapolis University, Play Tennis in Cyprus, Sports Psychologist Cyprus, Sports Psychology Cyprus, Tennis, Tennis Academies in Cyprus, Tennis Academy, Tennis Centre, Tennis Club, Tennis Clubs in Cyprus, Tennis Clubs in Limassol, Tennis Clubs in Paphos, Tennis Coaching, Tennis Coaching Pafos, Tennis Courses, Tennis Equipment, Tennis Holiday, Tennis in Cyprus, Tennis in Limassol, Tennis in Pafos, Tennis in Paphos, Tennis Lessons Coral Bay, Tennis Lessons Cyprus, Tennis Lessons in Cyprus, Tennis Lessons Peyia, Tennis Lesssons Pafos, Tennis Peyia, Tennis Pissouri, Tennis School, Tennis Tournaments in Cyprus, Womens Tennis by Paphos Tennis Coach. Bookmark the permalink.